As a source of the monochromatic and coherent radiation we will use two lasers with a wavelength λ1 = (632 ± 10) nm and λ2 = (532 ± 10) nm. Their radiation falls on the screen with the slit. The diffraction pattern intensity distribution behind the slit is measured by the semiconductor photodiode situated at a distance a from the slit a = (2152 ± 1) mm (see Fig. 3) and using the V-meter modules of the system ISES. 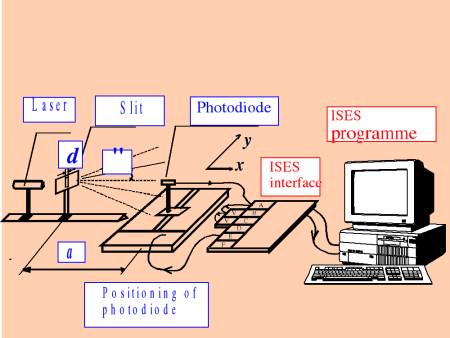 The photodiode is attached to the XY plotter enabling the recording of the diffraction pattern. 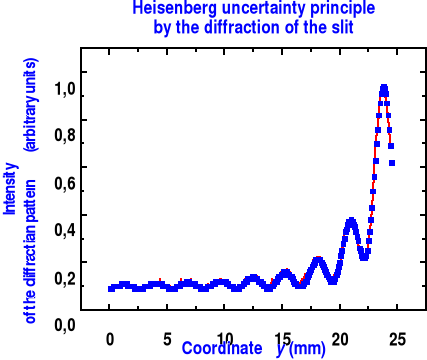 The schematic arrangement of the diffraction experiment for the proving (disapproving) the Heisenberg uncertainty principle is in the Fig. 3.